Sometimes the occasion calls for something Old and Wise, and Arran have produced just the bottle. A delightful single cask 1996 vintage, this bottling is taken from spirit distilled in Arran’s second year of full-time production. The whisky has been aged in cask number 55, a former Sherry hogshead. These casks are known for performing well with long maturation, as is shown by this beautiful dram. 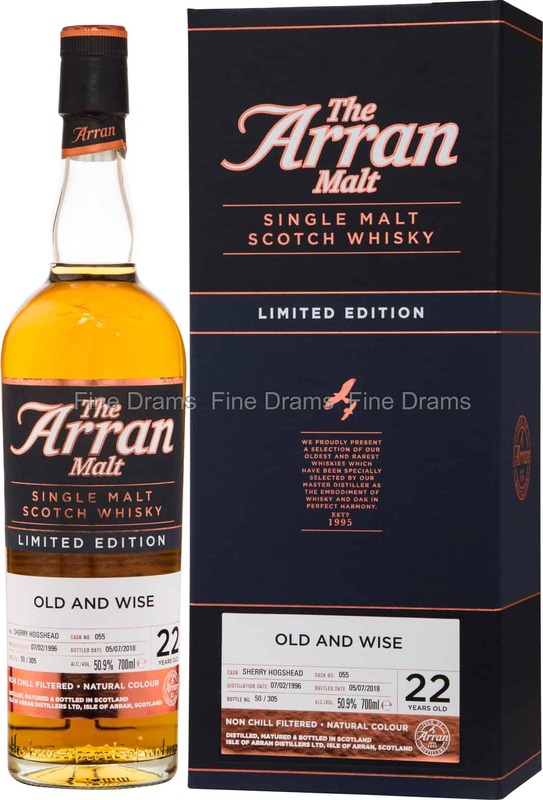 Aged for 22 years, the whisky has developed complex, deep flavours of jammy berries, dried fruits, toffee, mixed spice, vanilla, classic Arran earthy malt, dark chocolate and milky coffee. Bottled at a cask strength of 50.9% ABV and without chill filtration or colouration, this presentation means the drinker enjoys all the natural character of this delicious drop. A limited edition whisky, just 305 bottles were produced.